Metering pumps move fluids through systems at precise adjustable flow rates. They have maximum discharge pressure ratings against which they are guaranteed to be able to pump. 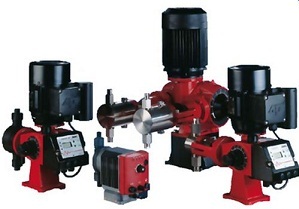 Metering pumps are commonly used to pump water, chemicals, and other liquids. Pump Express customer service agents are standing by to provide technical assistance, price quotes or to answer any questions you may have regarding the metering pumps we stock and sell. Call Our Toll Free Number 1-800-298-4100.